The craft of making paper basically is still the same as it was when the whole notion of paper invention emerged in AD 105. 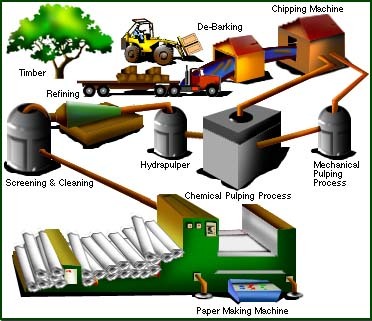 The core of paper making involves preparation of stock, formation of the paper web, drying the sheet and finally application of coating and additives. Nowadays the only difference is the technology and new innovations involved in the craft. European paper makers for instance, chose to craft it out of materials like cotton and linen fiber from rags. Initially, sorted and cleaned rags are heated in an alkali solution. This is done in an open vat before the rags are passed under steam pressure. Then the drained and seasoned rags are washed and macerated to a pulp that will be bleached as to remove the unwanted traces of dyes and residual darkening due to the cooking process. Paper get its form when a paper mold is lifted out horizontally after being dipped into the vat of stock. This happens when the fibers gets trapped against the screen of the mold. Hand made paper molds consists of parallelly lengthen wires being laced together either by fine wires, threads or even woven wire mesh. Removed sheet from the mold is pressed on the felts or woolen cloth. Post, a stack of paper sheets and felts placed in a large wooden screw press will then be tightened by the workers of the mill by pushing or pulling a long wooden lever. This leads to the production of an average of 6-8 inches post out of a 2- foot. Once this task is completed, the pressed sheets will be lifted and left to dry in relatively low number of groups known as "spurs". Far away from soot and dust the "spurs" are dried at the highest level of the mill. Animal glue and gelatin is used to make the paper less absorbent, and this is particularly important for writing papers. Early 17th century witnessed the pioneer method for smoothing paper using glossy stone and a water-powered hammer as a finishing touch.